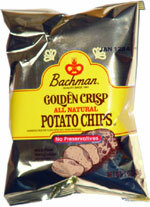 Taste test: These are good conventional potato chips, very crisp with a rich potato flavor and not very much salt. They've got a good potato flavor, but I think that more salt would help to bring out the flavor more. Smell test: Regular potato chips smell. Trivia: This bag of chips was an unintentional purchase. I was buying a chicken salad sandwich, which unbeknownst to me included this bag of chips. When I got home and opened the bag that the chicken salad sandwich came in, I discovered this wonderful surprise. 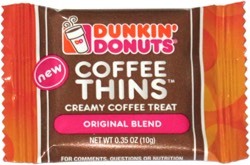 This snack was discovered by Jeremy at Sarah's Market & Deli, Cambridge, Massachusetts. Review published .